Stay tuned for official news over the next few weeks regarding Brightcove's new personalized video delivery service. Here's how it works. Come to our new forthcoming site and browse through a tag cloud or recommendations from your friends/neighbors to find the video(s) you want. We prebuild the recommendations from your browser history using some crazy AI kung-fu. And there's a pretty neat Ajax interface that makes the discovery and ordering process a snap. Add a pint of Ben and Jerry's to your order. Perhaps a Snickers. 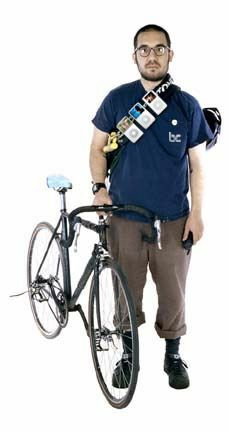 Request the time of delivery (not date, mind you) and just kick back until a Brightcove Associate (right) pulls up astride his Brightcove-blue Cannondale, loaded video iPod in hand, and insulated messenger bag filled with munchies. To return the iPod, just drop it in a conveniently located dropbox in your neighborhood. We're thinking of calling the service Vo7mo (pronounced vozmo). It's a very Web2 kind of a name. We feel pretty left out of the whole zeitgeist here in stodgy old Cambridge and hope the new subbrand will bring us a little visibility out west. We leapfrog the whole high-def DVD war with near real-time delivery. Cable VOD is still too complicated for some people, DVD rentals by mail are too slow and the local video chain store is kinda depressing. Three letters - CGM. Load up the iPod with your own video before you return it. We'll load that video up into the service for the rest of the users. Mashups. Reorder the video clips in your own playlist and watch them in any order! Share that playlist with the rest of the community when your return the iPod. We're launching a public beta Saturday, in several select markets. If you are interested in trialing, leave a note in the comments field below.